Hi Friends! 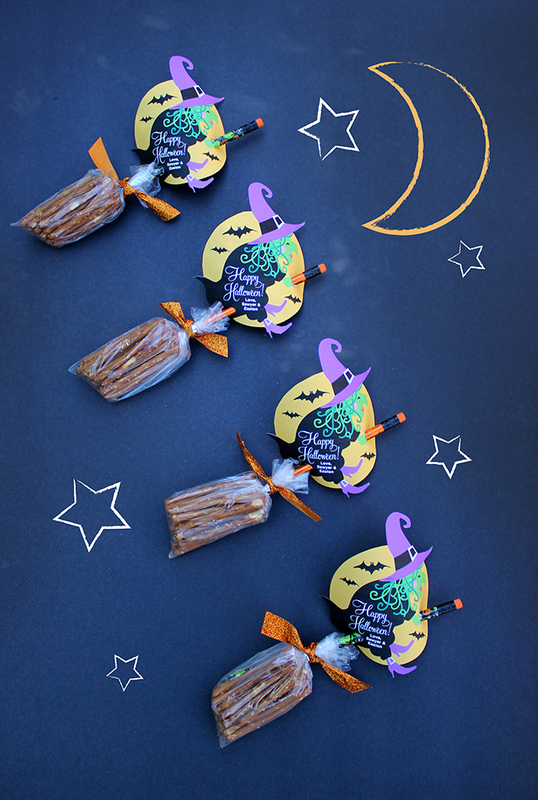 I am so thrilled to share this fun, super easy, and really adorable Halloween treat with you today. 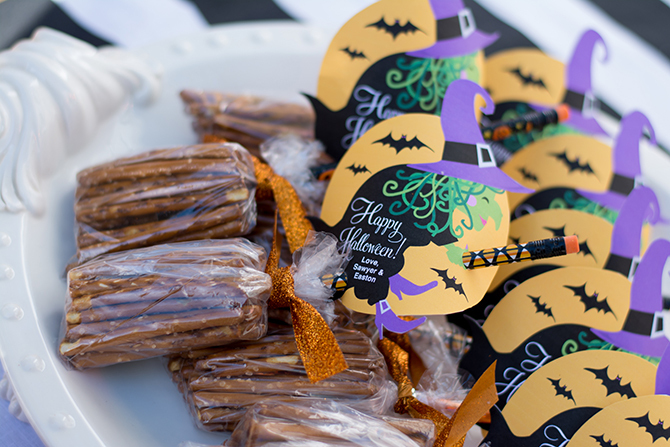 I made these Halloween Witch Pretzel Broomsticks as a little favor for all of the little ghouls and goblins that came to our Witches, Boos, and Spiders Too Halloween party. They loved them! 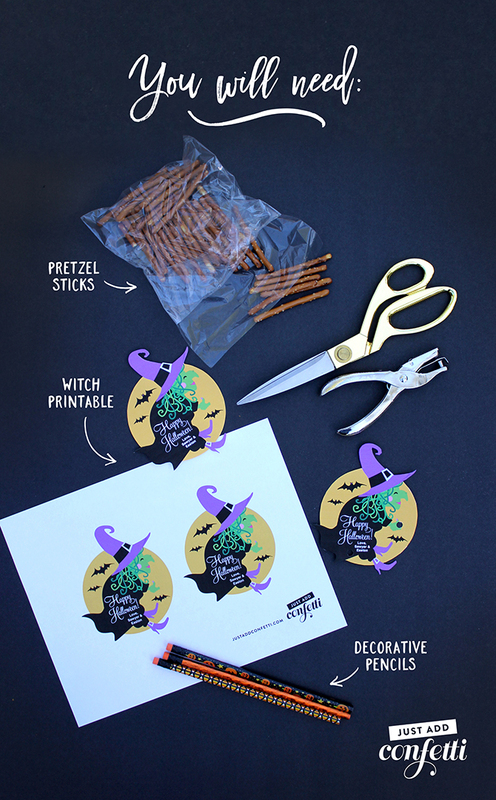 I think they are so cute and they only require 4 items—pretzel sticks, a plastic bag, a decorative pencil, and this printable. So easy! First, download the printable (located in the printable library—more info at the bottom of this post). The printable is a PDF file that contains editable fields. Just open the PDF in Adobe Reader and fill out the name field. Then just save and print. Lastly, place some pretzel sticks in a plastic bag and tie the bag to the end of the pencil. I also cut off the excess top part of the bag that was sticking up too high. I found it was easier to use a twist tie to firmly attach the bag to the end of the pencil. Then I tied a glittery ribbon overtop of the twist tie. Download the Free Printable in our Library! I hope all of the little ghouls and goblins in your life like this little treat! 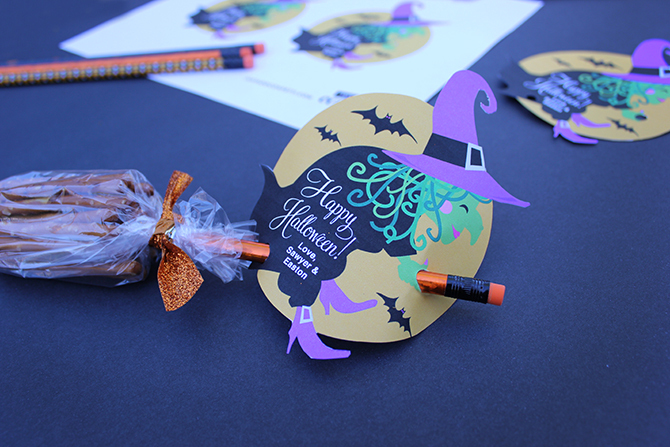 I think it makes a perfect classroom treat, party favor, or little gift. Also, it’s not candy…so slightly healthier than all the sugar that will be coming home after trick or treating!